An infant apnea monitor or a baby breathing monitor is a small device placed in the room of a sleeping infant so the parents can be sure their baby is breathing. Some babies leave the hospital with an apnea monitor but with others apnea is detected after coming out of the hospital. Apnea is a greek word that means "without wind". Apnea is the cessation of breathing. This is quit common in prematurely born babies. These pauses in breathing can be very frightening for parents. A baby breathing monitor can provide some peace of mind for worrying parents. Pauses (cessation) of breathing during sleep. Colour change (The infant is pale or bluish). The combination of apnea , colour change ( cyanotic or pale), marked change in muscle tone (limpness), choking or gagging is an ALTE (Apparent Life-Threatening Event) . Such an episode is very frightening to the observer. Most children who experience an ALTE are given a sleep apnea device. Never shake your baby to make him breath again, this may cause serious head injury. Contact your healthcare provider immediately if you suspect apnea in your infant. If your baby has medical difficulties it is crucial you know how to resuscitate and learn about infant CPR. This can save your baby's life. Obstructed sleep apnea - When tonsils or adenoids are blocking (obstructing) the airways. Symptoms of this type of apnea are snoring, laboured breathing, changes in color and restlessness. It usually occurs during sleep. Central apnea - Is a defect of the brain that controls breathing. This happens when the brain does no send signals to the breathing muscles. We talk about central apnea when breathing stops for more than 10 seconds (20 seconds in infancy). It is common in premature babies and can happen any time of the day (daytime apnea). Mix apnea - Contains elements of both obstructive and central apnea,either in the same apnea pause or at different times of the day. What is the difference between Apnea of prematurity and infant apnea? Apnea of prematurity (AOP)- Is apnea of infants born before 37 weeks (about 9 months) after conception. This apnea is caused by respiratory immaturity. Apnea of infancy (AOI) - Is when apnea persists in a neonatal born 37 weeks after conception. Sometimes these epsiodes of infant apnea are caused by an infection or a heart problem, but in most cases no specific reason can be found. As baby grows older the episodes of apnea will get less, and eventually stop happening. Can an infant apnea monitor prevent SIDS? There are numerous baby monitors that are advertised to be able to reduce a baby's risk of SIDS. However the AAP (American Academy of Pediatrics) recommends parents not to rely on home apnea or breathing monitors to prevent SIDS. They admit that theses monitors may be useful in some cases were an infant has suffered an ALTE, or has recurring episodes of apnea. How does an infant apnea monitor work? Some infants are discharged from hospital with a portable home monitor device. They use stick on patches or a belt that will be attached to baby's chest. 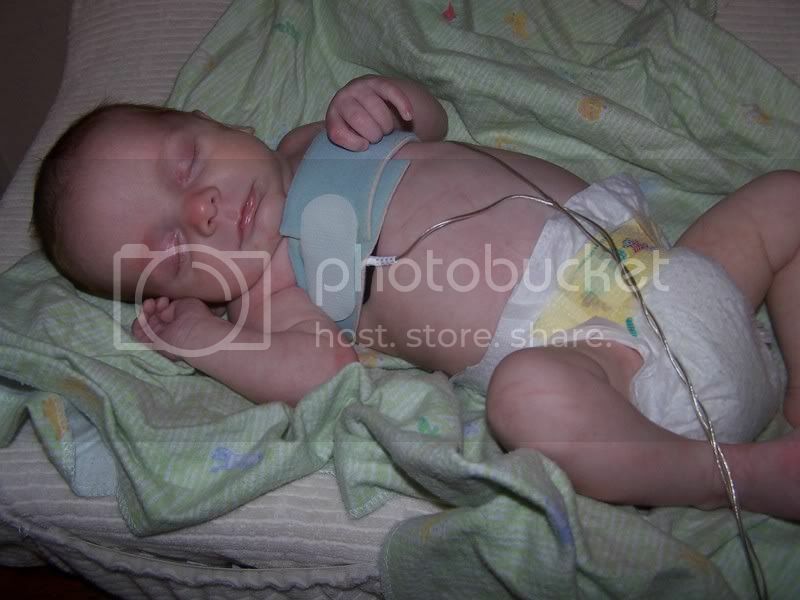 This type of infant apnea monitor is used for babies with persistant apnea, severe reflux or family history of SIDS. The device monitors the breathing and heartrate of the baby. Of course the monitor is not a device that can make your baby start breating again but it will monitor your baby and warn you so you can take action. Most of the new home monitoring systems can detect even the slightest movements often causing false alarms. Choose your infant apnea monitor with care. They should give you some peace of mind, not keep you up all night. If you are looking for a good breathing monitor for your baby, stay safe and use a cordless monitoring device. They are also extremely handy if your baby sleeps in multiple places. Portable baby monitors like the Snuza Halo Mobile Baby Movement Monitor can be used whether he is sleeping in his crib, in his bouncy seat, or even in his carseat. You simply clip the monitor on on the waist band of baby's diaper. If the monitor cannot detect movement for longer than 20 seconds an alarm goes of. As it is made of hypoallergenic materials and will not cause irritations or allergies. For many years Angelcare succesfully sold breathing monitors with sensor pads that are placed under the baby's mattress. Though the cords that connect the pad with the monitoring device have caused the death of two infants. In both cases the babies managed to pull the cord into the crib and they were found strangled. If you recently bought an Angelcare monitor, stop using it and contact Angelcare at (855) 355-2643. You are able to obtain a free repair kit with protective cord covers, proper warning label and new users instructions. Looking for the best thermometer for your baby?